Are you tired of having cold legs and wet clothes to deal with when you go fishing and hunting? If so, then it’s time for you to look into breathable waders. Breathable waders will give you the comfort of remaining dry, both while hiking to your destination and after wading in. Waders are breathable because of the type of material they are made with. They work by allowing water vapor to dissipate through the material while stopping liquid water from entering. This means that if you are fishing or hunting on a warm day and have to hike and move around a lot to get to your destination, your sweat will evaporate through the waders, keeping you dry and cool. Breathable waders are made with either nylon or polyester, which facilitate comfort and sweat evaporation, and have an outer covering of Gore-Tex, which provides a waterproof barrier to prevent leaks. One of the main things you want to think about while shopping for waders is whether or not you will be comfortable in them. Waders are worn for long periods of time to fish or hunt, so you need be able to move well and have waders that aren’t uncomfortable; otherwise, you will not enjoy your trip. The second thing to consider is sizing. You have to get waders that fit you well, whether they are stockingfoot or booted waders. Make sure that you understand the sizing instructions if buying online and measure yourself as instructed. Lastly, make sure that you will be able to keep all your hunting and fishing essentials with you while wearing your waders, preferably so that you don’t have to haul around an extra bag. Now that you know what to look for in your waders, it’s time to start comparing brands and types of waders to make sure that you get the very best match for you. These waders are extremely well built. They are made with durable 4-ply nylon to keep you dry and cool. They have double-layered reinforcement on the knees and shins to prevent leaks due to wear. They also sport adjustable shoulder straps to make sure that they fit you comfortably. Their stockingfoot design is built with neoprene booties to prevent your feet from slipping in wading boots. These waders also have insulated chest pockets to allow for easy access and storage of keys, phones, or small fishing equipment that will come in handy. It also has a flip-over pocket to protect phones and other equipment that need to be kept dry. 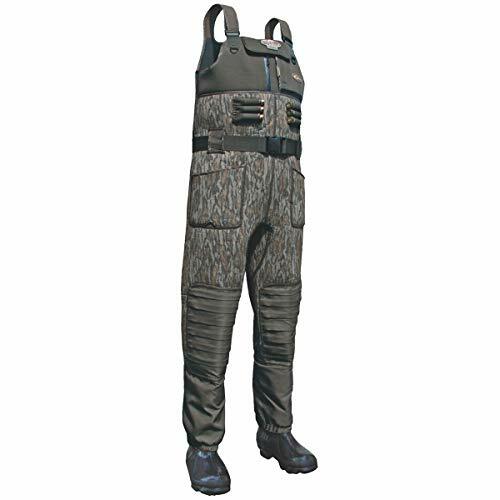 COMPASS Deadfall Breathable Stockingfoot Chest Waders are an excellent choice for anyone who is going to be moving a lot to get to their fishing or hunting destination. Having neoprene booties to ensure that your feet aren’t slipping around while hiking will provide comfort for long use and save you the time of having to adjust your shoes all the time. The reinforced material over your knees and shins will prove helpful when you need to be kneeling to clean a kill or to get in the best place to wait for your prey. The only con of these waders is any possible complications that can arise with sizing, but if you read the sizing instructions this shouldn’t be an issue for you. Plus, the adjustable shoulder straps can serve as extra sizing insurance. 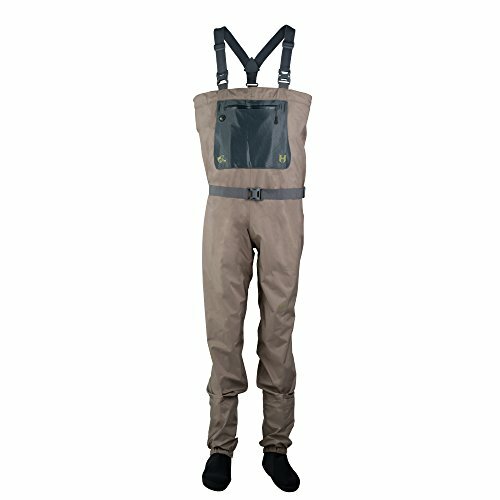 Overall, COMPASS Deadfall Breathable Stockingfoot Chest Waders are great quality waders that will be sure to serve you well in your fishing and hunting trips. These waders are built with comfort in mind. Nylon material is used in production so that the waders are lighter than others but still provide the same waterproofing. These waders are of the boot foot design and have tough rubber boots that are heat welded to the leg material of the waders to ensure a waterproof seal. They have adjustable H-back shoulder straps to make sure that any added weight to the waders is evenly distributed to keep you comfortable. They have a flip-out chest pocket for storage of personal items and two D-rings in front for any equipment you might need to attach. FISHINGSIR Chest Waders are a great choice for someone who is looking to be comfortable and still have all the perks of other heavier waders. The use of lighter material makes them more comfortable for long use and if you are going to be in warmer weather while wearing them. Having the adjustable straps adds extra ease for sizing and use, although you will still need to make sure to size your waders carefully so that they fit well. Having the heat welded attached tough rubber boots can be seen as both a pro and a con. If you are going to have to do a lot of hiking to reach your destination, these may not be the waders for you, as hiking in rubber boots can cause blisters and discomfort. However, the boots will not be a problem if you are going to be doing less walking and more wading in the water for your prey. Overall, these waders are excellent for comfort in warmer weather. These waders are built to last you a long time. With their reinforced knee padding, you can spend time kneeling to clean what you have caught immediately and not have to worry about ripping your waders by kneeling on a rock. They also have internal seams that have extra wide waterproof seam seal tape to ensure that you stay dry the whole time you are in the water. In addition to this, these waders have against the body handwarmer pockets to keep you comfortable. They also have a large waterproof chest cargo pocket to keep any personal items that you need. Along with this pocket, these waders have buckshot sleeves for added ammunition storage in case you run out. Drake MST Eqwader 2.0 Chest Waders are great waders for uses in colder temperatures and long exposure to cold water, as the internal seams are sealed with extra wide waterproof tape to make sure you stay dry. You can also keep your hands warm using the against the body handwarmer pockets. These waders are excellent for duck hunting in particular, as you can store extra ammo securely in them and gain extra comfort from reinforced knee padding while kneeling during a stakeout. The only downside is that the shoulder straps are Velcro adjustable. While they can wear down over time, this a very small con that can be easily overlooked for all of the perks that these waders have to offer. These waders are built to be easy to use and durable in many conditions. They have neoprene insulated boot bottoms to make sure that your feet don’t get cold from standing in cold water for long periods of time. They also have ankle contour to prevent slipping around the heel of your foot, providing stability while walking and comfort as well. They also have adjustable shoulder straps to ensure that your waders fit you properly. These waders also come with a detachable, adjustable belt for a good fit and to hang equipment on as needed. They also have a large chest pocket to store any items that you may need while hunting or fishing. LaCrosse Men’s Alpha Swampfox Waders are a great choice for folks who are looking for a pair of simple yet quality waders that are easy to use and durable for different times of use. With well-insulated boots to keep your feet dry and warm, even in cold water for long periods of time, these waders can be used in many different areas and at different times in the year. If you are going fishing in the colder months, you can use the adjustable shoulder straps and belt to allow you to layer up warm clothing underneath the waders while still keeping dry. The only downside is that the attached rubber boots can cause some discomfort if you need to do some hiking in order to get to your destination. Overall the LaCrosse Men’s Alpha Swampfox Waders are a great choice for you if you need easy use, durability, and reliability. These waders are a great buy for many reasons. Built with easily adjustable shoulder straps, they also have a wide range in sizes to make sure that you can find the perfect fitting pair of waders for you. They are the stockingfoot design and have anatomically correct left and right foot neoprene booties that will be comfortable and prevent slipping in your wading boots. These waders also have a large chest pocket that is perfect for storing keys, phones, and hunting or fishing licenses to make sure that you have everything you need. They also have fleece-lined handwarmer pockets to make sure that you can stay comfortable even while hunting or fishing in colder temperatures. 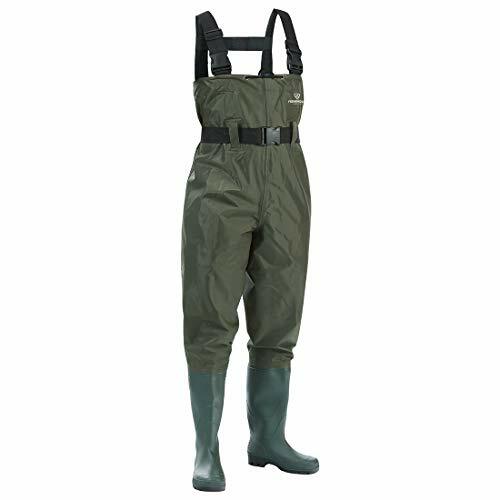 The Hodgman H3 Stockingfoot Chest Waders are an excellent choice for people of any size who are looking to find a pair of waders that will keep them comfortable with proper sizing and adjustable shoulder straps. The neoprene booties also offer added comfort by being anatomically correct for your feet and preventing slipping in your shoes. While these waders do have fleece lined hand warmer pockets to keep your fingers warm in the cold, they do have a limited amount of storage in the chest pocket and no additional rings or loops to hook other equipment that might be needed onto. However, this is a small downside if you are going to be using a boat or stakeout sight in which you can keep additional gear. Overall, the Hodgman H3 Stockingfoot Chest Waders are a great option for people looking for a simplistic and practical pair of waders that don’t have too many additions to get in the way. Now that you have seen some great options of different waders, learned how breathable waders work, and know what qualities to look for in a great pair of waders, you are ready to find the perfect pair for your hunting and fishing needs. While we have covered a lot in this article, you still may have some questions about breathable waders that were not covered. Hopefully, these following answers will help you understand what you need to know before you buy your own waders. Do I Need a Camouflage Design? No, it is not necessary to have a camouflage design on your waders. While the design can help you blend into some environments, that would be mainly useful for duck hunting. If you are planning on using your waders primarily for fishing, then you won’t need camouflage. How Do I Store Hunting Waders? The best way to store hunting waders is hanging them up. Before taking them off, make sure you thoroughly clean off all dirt, grass, mud, or sand, then hang them up and let them air dry. Folding would put pressure on seams and can cause leaks to form. 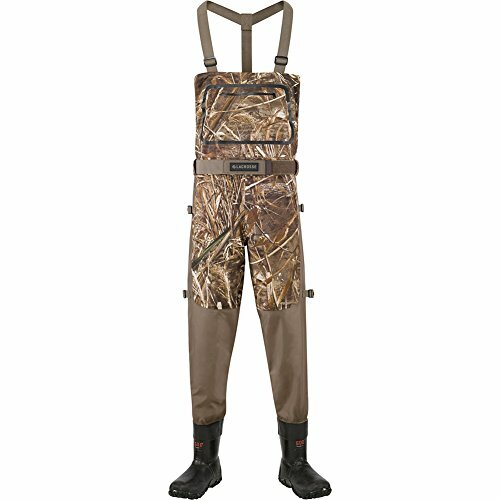 How Do I Know What Size Waders To Get? If you are shopping for your waders online, make sure to look at the sizing chart and carefully measure yourself as instructed to ensure that you get the best fit. If you are shopping at a store, ask an employee to help you find out what waders fit you the best. Initially yes, all waders are waterproof. How long they stay waterproof depends on the quality of the material used to make them and how well they are cleaned and maintained by the owner. If not properly cared for, they will likely develop leaks faster than if they were properly maintained. Do You Wear Shoes With Waders? Yes, although the type of shoe that you need varies with the design of waders you buy. Some waders have rubber boots built right onto them and the tops heat welded to prevent leaks. Others have neoprene booties that serve as a waterproof sock and you have to buy wading boots to wear with them.